Here at ServiceMaster Clean, we get asked the same questions by our customers over and over again… So we want to save you some time! 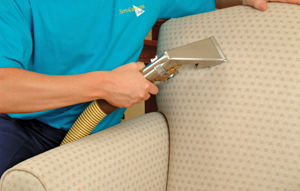 Here are our most frequently asked questions about upholstery cleaning. Q. Will my carpet or flooring be protected during upholstery cleaning? A. We always clean upholstery on a waterproof sheet to protect the carpet or flooring below. Q. How long does it take for upholstery to dry after cleaning ? A. Depending on the fabric, some upholstered frames dry before we leave, but some cushions, depending on the fillings, can take up to 24 hours to dry fully. Q. How long does it take to clean a 3 piece suite? A. A full clean on a 3 piece suite takes between 2 to 3 hours depending on amount of loose cushions and the level of soiling. Q. Can stain protection be applied to my upholstery following cleaning? A. We can apply a stain protection, however it is a solvent-based product so it has to be applied once the upholstery is dry, which would generally involve an additional visit to site. 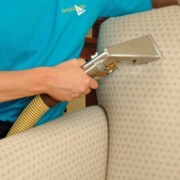 Find your local upholstery cleaning expert here.